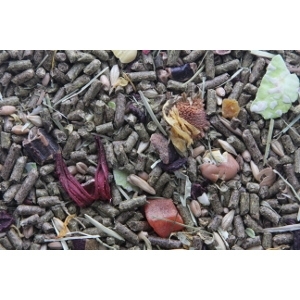 HIGGINS SUNBURST is the premium gourmet companion food loaded with natural goodness for small animals. Formulated as a food and treat all in one, SUNBURST for Chinchillas contains mixed fruits, sun-cured hays, vegetables, legumes and much more! What you won’t find in SUNBURST are artificial colors and preservatives. HIGGINS SUNBURST is enriched with DHA and balanced omega fatty acids to support the immune system. For a healthier digestive system, SUNBURST uses protected probiotics to ensure a higher amount of active, beneficial bacteria.